Tom kha is a base coconut broth that becomes tom kha thale (with seafood), tom kha het (mushrooms) or tom kha mu (pork) when variants are added to it. I ordered mine with just vegetables ($5), which included slender, blanched green beans, ornate carrot coins, torn cabbage leaves, and plenty of mushrooms. The produce was toothsome and offered crunch to an otherwise silky soup that was tinged with flavors of lime and lemongrass. To balance the subtle sweetness of the coconut, droplets of chili oil shimmered on the tom kha's surface and provided bright heat and deep, rich flavor. The milky white soup is divergent from many other broth-based Asian dishes that feature crystalline stocks, brown in color, like ramen or pho. Despite the close proximity of these soups' country of origin, the difference in each is blaring. 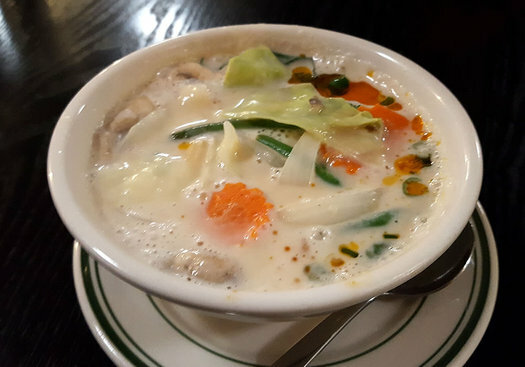 Tom kha on its own is enough to provide an acute remedy to limited knowledge on Thai cuisine, especially in the ways opposing flavors dance gracefully in each bite. There is clearly a play towards balance between the cooling nature of the soup with the prickly heat of the chili oil; the defined texture of the vegetables with the nebulous silken broth. 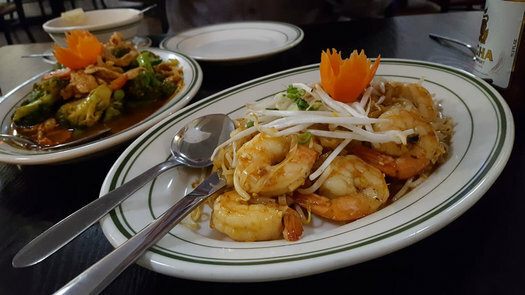 That concept is imbued throughout the menu at Celadon Thai. King's curry with chicken ($12, ordered at heat level 3 on the color-coded spice scale and was enough to make my nose drip) and shrimp pad thai ($15) rounded out the meal, which included two bottles of Singha brand beer to wash the heat down with. The second-coming of urban epicenters leads to exciting times for food. New ideas, creative menus, and holistic approaches to the local foodshed are sure to follow and spur on the revitalization of our core cities, but those places in-between, the byways that let us traverse the region, should not be ignored. Celadon Thai is proof of that. 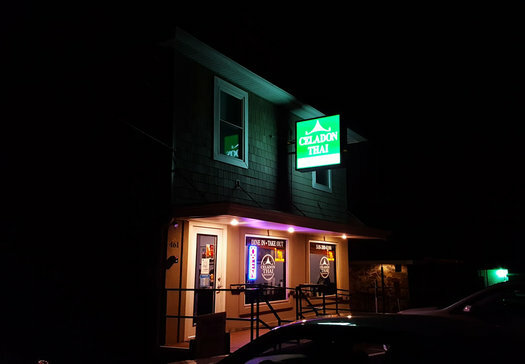 Celadon is a worthy entry to be sure, but for an even more valuable family-run gem, head down the hill into Watervliet to Sadudee. Excellent food and genuinely warm service. I can't fathom why the place doesn't get more attention. I second Fisher's recommendation of Sadudee. Every meal we've had there has been great. Why did this have to get printed...now everyone will know about Celadon Thai and Sadudee..both hidden gems....but we do want to keep both in business, so I guess the publicity is a good thing!! !